Finger knitting is a way of knitting without needles. It is also called finger weaving. You can finger knit with one, two, three or four fingers depending on the thickness of the cord you want to use to make your project. People of all ages can finger knit - ages 4 to 99. Finger knitting is a fun activity for young children and is a great way to introduce knitting to children. After learning how to finger knit, It will be easier for a child to understand knitting with needles. Finger knitting is a great project for children on rainy days. All you need is colorful yarn. It is, also, an excellent group project for Scouts, 4-H, school class projects and birthday parties. What can you make with finger knitting? 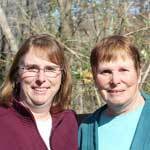 At the end of this post, you will find links to some finger knitting project tutorials. For more free finger knitting projects, our Finger Knitting page has wonderful ideas. 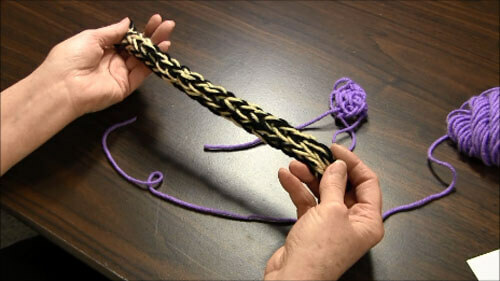 Watch this video tutorial and read on to learn how finger knit. Watch our Video Below or Click the link to watch Learn how to Finger Knit in Youtube. Start by holding the end of the yarn between your thumb and hand of your non-dominant hand with the yarn tail hanging behind the hand. Make sure to hold the yarn firmly in place. With the palm facing you, use the other hand to wrap the yarn in front of your pointer finger, behind your middle finger, in front of your ring finger and around your little finger, behind your ring finger, in front of your middle finger and behind and around your index finger. At this point you will have yarn wrapped around the front/back of every finger. Repeat the sequence again: front of pointer finger, behind middle finger, front of ring finger, behind and around little finger, behind ring finger, front of middle finger and behind index finger. At this point, you'll have two loops on each finger. Starting with the little finger, pull the lower loop on your finger up and over your finger making sure to keep the second loop on your finger. Continue this process for ring and middle finger, pulling the loop up and over your fingers. Bring the tail, which you were holding firmly, in between your pointer finger and your middle finger. You just completed your first row of finger knitting and now have one loop on each finger. Push the loops on your hand down. Begin wrapping the working yarn in front of pointer finger and repeat the behind and in front sequence so you have two loops on each fingers again. Repeat Step 3,, bringing the lower loops up and over each of your fingers. When you have completed the desired length, it's time to bind off. This is what your work will look like so far. Keep knitting until you have the length you need for your project. You should have one loop on each finger. Take the loop on your little finger and move it to your ring finger as shown in the photo above. Pull the lower loop on your finger up and over your finger making sure to keep the second loop on your finger. Repeat the process - move the loop on your ring finger to the middle finger, pull lower loop up and over your finger. Move the loop on your middle finger to the pointer finger and pull lower loop up and over your finger. At this point, you have one remaining loop. Cut the yarn but leave a short tail. Insert the tail into the remaining loop and pull tight to secure the finger knitting. Finger knitting is a great rainy day activity for kids because all you need is some colorful yarn and fingers. Have you seen loop yarn in craft stores? The yarn features unique preformed loops so no knitting needles are required to use it. All you need are your hands! This loopy, puffy yarn makes it extremely fun, quick and easy to knit blankets, scarfs, pillows, cowls and more. It makes knitting easy and fun for children, pre-teens, teenagers and even adults. To learn more about this yarn, how to use it and get free project tutorial, visit our Loop Yarn Knitting Tutorial page. 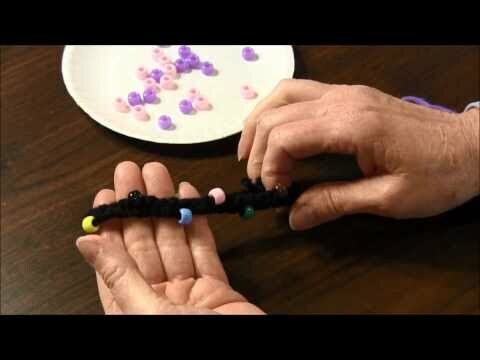 Beaded Friendship Bracelet - A fun bracelet that kids can knit and give to friends. Infinity Scarf for Doll - Do you have someone how loves dolls? Show them how to make infinity scarfs for their 18" doll. 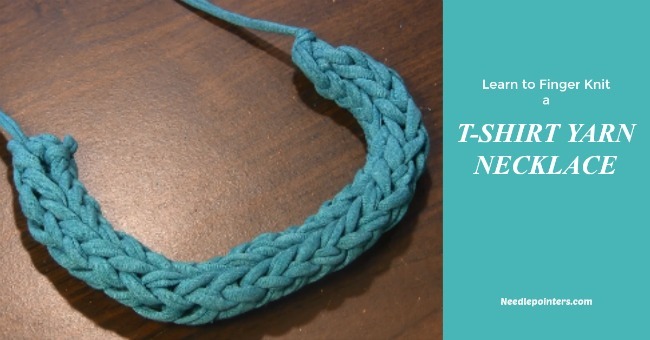 T-Shirt Yarn Necklace - A t-shirt yarn necklace is a great project for kids, tweens, teens and adults. It is SUPER QUICK and SUPER EASY and SUPER FUN .